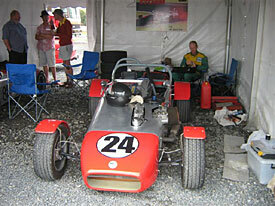 A few months ago I received a call from my old (and I mean old) mate Bill Stone, inviting me to drive his Mallock Mk6b Clubman at the NZ Festival of Motor Racing celebrating Chris Amon. Although delighted to be offered the drive in Bill’s pride and joy, I was a bit apprehensive about it, as although I do a bit of hillclimbing, I hadn’t raced on a track with other cars since 1985. Too good an opportunity to pass up though, I set about getting my competition license and headed for Hampton Downs. I have always had a soft spot for Clubman cars, having seen them race at Amaroo and Oran Parks in Sydney, when I was a kid. Similar in performance to a Formula Ford, but without the expense of a racing transaxle. A really good, efficient, effective racing car. And I had met Arthur Mallock in his home in the UK, where he quizzed me at length about caster angles and scrub radius effects. I was quite impressed that he was still keen to improve the Mallock breed at the age of 78. First visit to the track was on Thursday, where I was given the chance to do a few familiarisation laps behind the pace car, in Chris Havill’s car. Thanks Chris; really worthwhile. Fifteen minutes practise in Bill’s car on Friday morning went well, working my way down to a 1;20.8 without scaring anyone (I hope). I was delighted to find that the car handled almost perfectly, with a nice neutral balance that could be tweaked into oversteer or understeer with suitable mismanagement of the controls. Love the track, especially the two top gear corners, for the Mallock Turn 1 and Turn 6, balancing the car up on entry before carefully applying the power to find the apex and exit flat. I found a bit more time in qualifying, managing a 1;19.5 before running into traffic and packing it in. That was good enough (just) for second on the grid, a tenth behind Russell Greer from Blenheim in the Stanton Corvette and a tenth in front of Paul Madeley in the Nerus Silhouette. First race on Saturday, and plenty of nervous concentration. I followed Bill’s instructions and made a reasonable start, but not reasonable enough to match the Stanton to the first corner. With the Stanton driving a defensive line and taking a while to get going through the corners, and me following suit, I was soon overtaken by Steve Sharp in his Lotus 7 and Paul in the Silhouette. All nice clean stuff, thanks guys. I have no recollection of what happened in the next few laps, but I found myself back in second, 5 seconds or so adrift of the Stanton Corvette, and managed a couple of 1;18.9s before running out of fuel with two laps to go. Bit of confusion about which dipstick belongs to which car! Made me feel like one as well. Not to worry, it was all good fun while it lasted. You should have seen the look on Bill’s face when he came back to the tent after the race and I told him that we’d thrown a rod! (Rather bizarrely, in my last race back in 1985, I ran out of fuel while in second place with two laps to go). Second race on Saturday, we were greeted by a nice wet track. The grip in the wet seemed really good on the lap to the grid, especially under brakes, so I figured those Michelin tyres must be a good thing. I was still P2 on the grid, this time alongside Paul who had done a rather impressive 1;18.2 in the morning race. The only drama awaiting me was a delayed start sign at the starter’s tower. Not knowing for how long the start would be delayed, I rather stupidly switched the car off, necessitating a bit of a panic when the first red light lit up! As a consequence I moved the car forward about a foot as I put it into gear. My start was OK again, but the Corvette blasted through from the second row, and set about his business. This time, however, with a bigger grip advantage, I managed to pass him at the first hairpin, and was pleasantly surprised not to have him pass me again on the run to the last corner. Pretty much plane sailing from there, the car handling almost exactly the same in the wet as in the dry, but about 7 seconds per lap slower. The only hiccough was being shown a time penalty notice at the start line, no doubt for starting out of position. So I pressed on, figuring that if it was a 10-second penalty, I still had a chance of winning the race. Rained off on Sunday, as you’re all aware, but with a win in the Mallock and Bill storming through to second in his first Formula Ford meeting in 40 years, and on the basis that you’re only as good as your last result, it wasn’t a bad time to quit. So thanks Bill and crew, Jim Barclay, Tony Roberts and Chris Watson of NZFMR and the friendly guys from HRSCC for having me. The event, the facility, the people and the atmosphere were fabulous. It’s lovely to see so many people taking the right approach to their motor racing and having some fun. Malcolm Oastler was Chief Designer at Reynard, Jaguar F1 and British American Racing F1. Malcom Oastler seated behind Bill Stones U2. Standing L to R; Brian Service, Steve Sharp and Dewar Thomas.